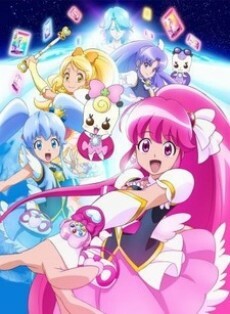 All around the world, Pretty Cures have been fighting against the invasion of the enemy known as Saiark! Shirayuki Hime, the princess of Blue Sky Kingdom is in fact a Pretty Cure, but unable to defeat the enemy alone, she is fallen behind the others and is in a quite a terrible situation. Then, on her quest to find a partner, she meets Aino Megumi (Cure Lovely) and they begin to battle the enemy together. Having learned that assembling all PreCards, you can get any one wish fulfilled, the team up with the fairy Ribbon to protect the world peace, transform, dress up and form change as they fight! With the dress-up theme beloved by girls, a completely different Pretty Cure story begins!